The Thomas Center, 302 NE Sixth Ave., is perfect for a Sunday afternoon of perusing through art and learning about different cultures. Diversity can open your mind and help you view things from a fresh perspective. The gallery’s newest exhibit, The Heart of a Culture: The Santos of Xavier Colón Marrero, features mini statues representing the Virgin Mary and has a Latin American influence. Spend the last Friday of every month from 7 to 10 p.m. walking through downtown viewing paintings, sculptures and live performances. Unlike a museum or gallery, you can explore the city with this self-guided tour. Artwalk could also be great for a date night. Walk hand-in-hand with your significant other on a journey through Gainesville’s art scene. If you’re tired of looking at plain, blank walls in your apartment, try redecorating. Relocate furniture just for the sake of switching things up and to bring new life into a room. Paint an accent wall to add a splash of color. Make a design like polka dots or chevron. Even use fall colors, such as rich greens or dark oranges for a homey, autumn feel. The J. Wayne Reitz Union offers non-credit courses on everything from home bartending to jewelry making for both students and non-students. Prices vary by class, but UF students and faculty members can receive a discount. 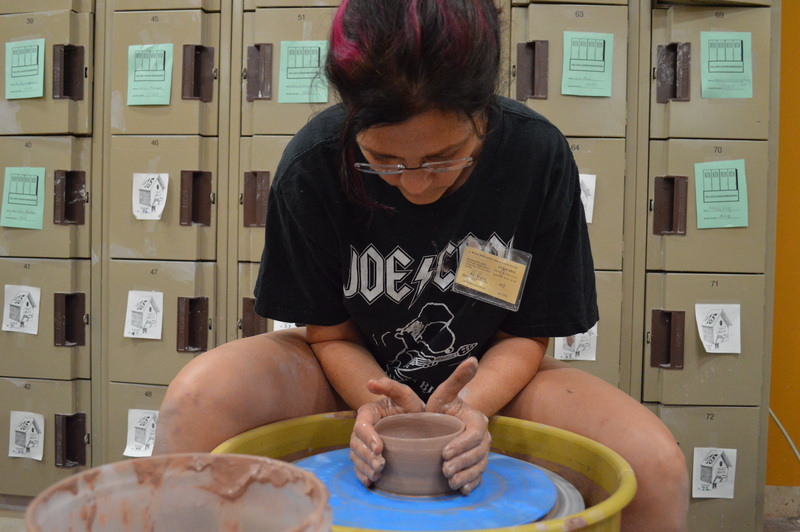 Beginning ceramics, for example, will teach you how to shape and decorate. Whichever class you choose, use it to peak your interest and rejuvenate your daily routine. How do you get into an artsy mood? Tell us by Tweeting at @oandbmagazine or tag us in a picture on Instagram.